The tourist relevance of Trieste might easily be classified as work in progress. Indeed, despite its historic heritage and the other assets that might always be deemed invaluable tourist capital, the city is often ruled out as an option in favor of other destinations, such as Venice. Yet, nowadays Trieste undergoes a major change as to its tourist performances, since it becomes more and more popular among those traveling for pleasure or among business travelers. Thus, the true potential of the city is rapidly unveiled, providing Trieste the occasion to make the best of its tourist assets. Once again the place regains its old fame, such as it was ascertained by sundry literates and artists, like James Joyce and Sigmund Freud. Long before the Roman rule, Trieste was populated by the Carni, by the Histri, and by the Veneti, the dominion of whom lasted for millenniums. From Antiquity to the Middle Ages, Trieste underwent a constant development, thriving as a result of being a significant geographic strategical point, at the crossing of several civilizations. The city gained a multicultural feature during the rule of the Habsburg Empire; however, as from 1920, when Trieste was annexed to Italy, the city lost much of its economic and cultural significance. During World War Two, the city was the only unfortunate place in Italy to host a concentration camp, and except for certain intervals when the city was estranged from the Italian administration, it became a definite part of Italy in 1954. 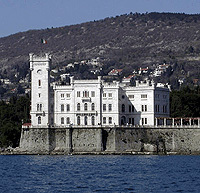 The historic center of Trieste hosts a series of hotels that can easily be classified as above mid range establishments. The prices practiced by such establishments parallel the quality services provided by them. However, hostels and camping sites are just as recommendable for budget travelers, despite the fact that most of them are located in less central arias of the city or even outside Trieste. All in all, the city is able to welcome tourists regardless of their financial possibilities and limitations. In terms of cuisine, Trieste hosts a large number of eating venues serving an incredible mix of specialties which, given the overall multicultural air of the city, reflect the many influences received in time from Italy, Austria and Slavic people. Thus, sea food is one of the main ingredients of which plenty of dishes are cooked. Brodetto (a fish soup) and flavored pilchards are worth noting, whereas the goulash and the large range of strudels represent the Austrian culinary heritage. With respect to drinks, one should know that Trieste has been having a special relation to coffee since the beginning of the 18th century, when it became the most important coffee port in the Mediterranean Sea. The Trieste Cathedral, the Mariano Temple and the San Silvestro Basilica count as the most significant religious establishments located in the city, whereas the Riccardo Arch and the Roman Theater belong to the historic heritage of the place. Other important landmarks refer to the Miramare Castle, to the Victory Lighthouse, the Colle Capitolino and to the Piazza dell'Unita d'Italia. The Little Berlin, the Joyce Museum, the Museum of Oriental Art, the Museum of History and Art, the Revoltella Museum and the Museum of the Sea are the most popular museums and galleries to be found in Trieste. The Trieste Film Festival, the International Short Film and Debut Works Festival and the Festival of Latin American Cinema are, obviously, events celebrating the cinematographic phenomenon, whereas La Bavisela, the Trieste Challenge, and the Barcolana, count as the most significant sports events hosted by the city. However, the Habitat, the Olio Capitale, FEST and the Operetta Festival are just as worth attending as the many other events the city is replete with. Bellavista, a 4 star hotel is located on the sea front, surrounded by beautiful pine trees and is only 5 kms distant from the Lignano Golf club, official link hotel 4 stele Lignano Sabbiadoro. This is the ideal setting for a relaxing summer holiday in a family run hotel.